This pretty circular crochet blanket is worked in the round, lies flat and has beautiful drape. Light and airy yet incredibly warm. I used one Whirl for this baby / lap blanket in the colourway “Sherbert Rainbow” working from the outside of the cake. You can use any yarn you wish, I went slightly larger than the recommended hook size for the yarn so that you get a nice drape to the blanket. Enough chatter – onto the pattern! SET UP ROUNDS - Please refer to the video if you become stuck at any point! 5. Ch5 (counts as dc, ch2), dc into same stitch. *ch1, sc in top of 2nd dc of petal below, ch1, [dc, ch2, dc] in top of sc from round below* x11. ch1, sc in top of 2nd dc of petal below, ch1, join with ss to 3rd ch of ch5. 7. Ch1, sc in same stitch. *ch2, [dc, ch3, dc] in sc from round below, ch2, sc in top of 3rd dc of petal below* repeat until end of round, substituting last the sc with a ss join to the 1st sc of the round. 9. Ch6 (counts as dc, ch3), dc in same stitch. *ch3, sc in 4th dc of petal below, ch3, [dc, ch3, dc] in sc from round below* repeat until end of round ending on ch3, sc in 4th dc of petal below, ch3, ss join to 3rd ch of initial ch6. The pattern is written slightly differently from the set up rounds for ease of reading. Please refer to the video if you become stuck at any point! Increase rounds are staggered. This may seem a little odd, especially when you are following the pattern, but if you do not stagger the increases, you will end up with a square edged 12 sided polygon shape rather than a proper circle. · To keep the blanket flat, every set of increase rounds (2 rounds, the v stitch set up round and the petal round) will be followed by a set of NON increase rounds (Rounds 13 & 14 are the non increase rounds). Increase petals consist of 7dc. Middle of a 9dc petal = dc into the 5th dc. Middle of a 7dc petal = dc into the 4th dc. 11. Ch1, sc in same stitch. 12. Ch1, sc in same stitch. repeat until end of round, substituting final sc with a ss to 3rd ch of intial ch4. 14. Ss into ch3 sp of V stitch. Ch3, 4dc. Repeat until end of round, ending with 4dc into 1st ch3 sp, join with ss to top of ch3. 15. Ch1, sc in same stitch. 16. Ch1, sc in same stitch. 19. Ch1, sc in same stitch. Repeat until end of round, substituting final sc with a ss to 1st sc of the round. 20. Ch1, sc in same stitch. 23. Ch1, sc in same stitch. Ch3, V stitch, ch3, sc in middle dc of petal below, ch3, V stitch, ch3, sc in middle of petal below, ch3, INCREASE, ch3, sc in middle dc of petal below. Repeat until end of round, ending on *[Ch3, V stitch, ch3, sc in middle dc of petal below]* 2 TIMES substituting final sc with a ss to the 1st sc of the round. 27. Ch1, sc in same stitch. Repeat until end of round, substituting final sc with a ss to the 1st sc of the round. 28. Ch1, sc in same stitch. Repeat until end of round, ending on: *[Ch3, V stitch, ch3, sc in middle dc of petal below]* 3 TIMES substituting final sc with a ss to the 1st sc of the round. 35. Ch1, sc in same stitch. 36. Ch1, sc in same stitch. Repeat until end of round, ending on: *[Ch3, V stitch, ch3, sc in middle dc of petal below]* 4 TIMES substituting final sc with a ss to the 1st sc of the round. 43. Ch1, sc in same stitch. 44. Ch1, sc in same stitch. Repeat until end of round, ending on: *[Ch3, V stitch, ch3, sc in middle dc of petal below]* 5 TIMES substituting final sc with a ss to the 1st sc of the round. STAGGERING BEGINS FROM HERE: On every other increase row, you split the start and end of your stitches before the first increase so that the increase sections do not sit directly on top of one another. · So, on this row, you will be doing [4, inc] BUT you split the first set of stitches before the first increase so START with 2, inc then go on to do [4, inc] around the blanket and you will end on the second half of your initial split, 2. Continue your increases in this fashion. End your blanket on non increase rounds. This is so beautiful! How big did your finished blanket end up being? Beautiful colors. 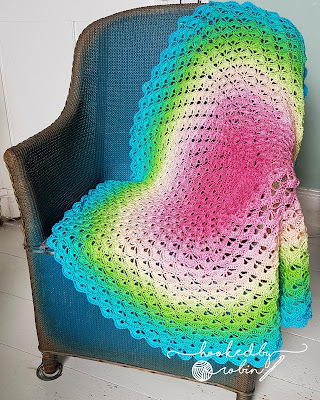 I love this pattern Im planning to try this. I'm just curious to know how much yarn is needed. I read through but may have missed it if you stated in the pattern. 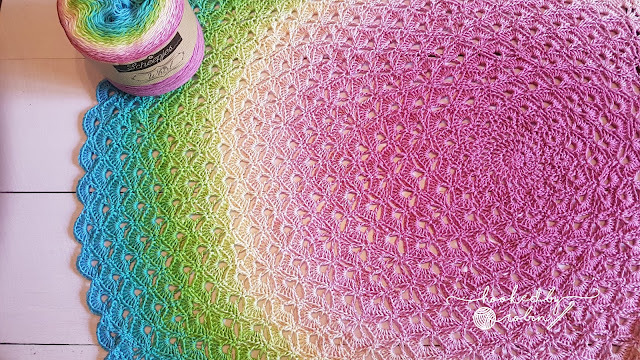 This is gorgeous and finally makes me want to pick up the hook again after losing all interest in crocheting for the past year. Hi. Thanks for the pattern! One pic looks like whirl, the 2nd looks thicker. Is it our tribe? I can't seem to find the same color match in that as I did in whirl. Robin, I like to save my pattern by either downloading them or printing (when I'm ready to work on them), how can I do this? Thanks and love this pattern. Hi Kathleen - you can copy and paste the pattern into a word processing document, like Word (MicroSoft) if you have it. Thank you so much for sharing your beautiful rug pattern with instructions even I can understand. Can't wait to make. Help! On row 19, there are not enough stitches for the final increase. I’ve counted everything multiple times. What can I do? I did the same thing and my mistake was on row 15. I increased every other sc instead of every 3rd sc. It increased the petal count too much. Hope this helps someone! Thank you for sharing your beautiful rug pattern with instructions even I can understand. Can't wait to make. How is the split done?.I understand increases not sitting on top of each other but the "split" baffles me. Doesn't look like anyone here has problems with it but me. Thank you for lovely pattern . Thank you for this pattern and the suggestion of yarn. I have completed my first blanket and it's absolutely stunning! I love that the pattern is easy enough to follow and it works up so quickly. Thank you again for sharing! I finished this blanket tonight and I must say it's my favorite one that I've made to date. I added an elephant border to it and it's so cute. I'm excited to give it to the lady I made it for. I made it to round 50 with the pattern. I thought I would like to go bigger but I'm baffled. I understand the staggering fine, I just can't understand the instructions to start row 51. I think I'll do fine once I get past that point. Thank you for making the pattern available. Thank you for your wonderful pattern and tutorial. WEll Done! Do you allow the sale of finished items. I do have a shop. I will, of course, give you full credit for the pattern design. Thank you Robin. I have two almost finished. I will let you know when I have posted them in the shop if you like. They are so beautiful. ;) Thank you again for sharing the pattern. Beautiful pattern - already have 3 wips on the go but am thinking will be 4 later on today! Love love love this! I just finished my fifth one yesterday (they're going to be gifts) and am considering making a sixth. I made a 70" wide blanket out of Lionbrand Mandala yarn in Gnome colors. Loved this pattern. It's beautiful. I have started this in Mandala as well, but it is curling a bit. What size hook did you use? Omgosh! 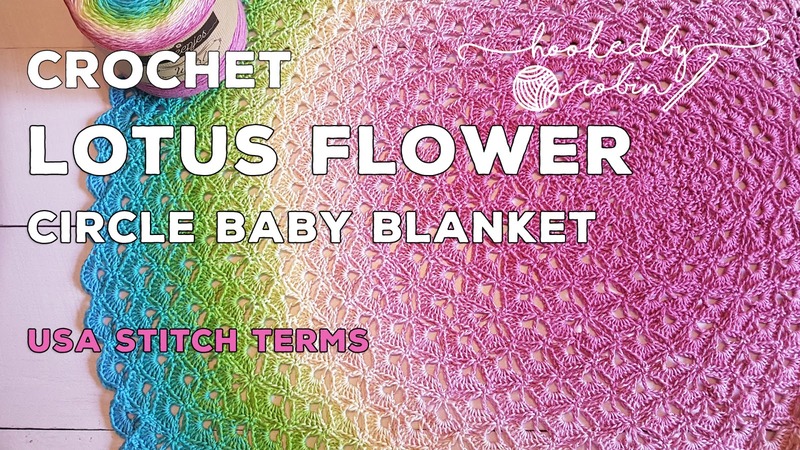 I have been searching for the perfect pattern to use to make a baby blanket out of my first Scheepes Whirl cake, and this is it!! Can't wait to get started! Thank you for sharing this gorgeous pattern. Blessings to you! Thank you for making this pattern so easy to follow. This was my first attempt at a circle blanket and learning to crochet. I couldn't be happier. I haven't actually finished the My Tribe version! *hides* It is destined to be a WIP forever I think ... oops! 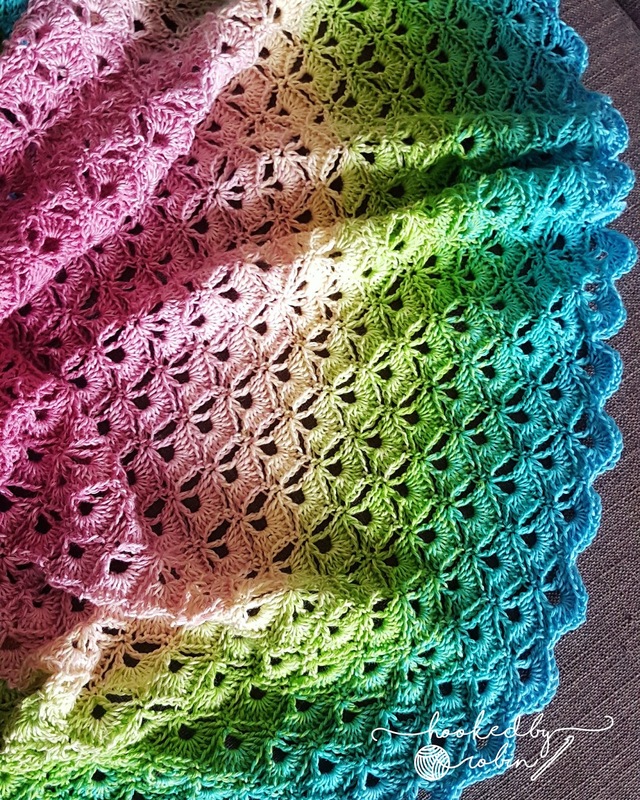 Can this be made into a shawl or square blanket? Thank you for your lovely tutorials. I'm a novice at crocheting and on top of that, English is not my native language. I've finally come to row 23 and now I'm unsure if I've done it right. How many increases have I made when I've finished round 23? Im on round 27 and if I have 5 Vstich and 1 INCREASE it does not come out even. 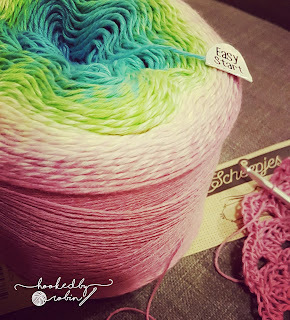 Does this round end with 4 Vstitches? Hiya - it ends on an increase so 5 v, then an increase is correct! Looks like I need to pull some apart. Everything worked perfect according to the directions until I got to thos row.Thank you for clarifying and have a great holiday season! How many shells should there be in round 24? I have 20 of the 9 stitch shells and 10 of the 7 stitch shells. Is this correct? THANK YOU so much for sharing this lovely pattern and tutorial videos! Everything about it is a delight. I really enjoyed following along with your videos, and it was so fun to make. I only made it to row 48 using up my Scheepjes Blackcurrant. It looks like I crocheted looser than shown, but it still looks lovely. Excited to gift this as a baby blanket. I just started this and I am using Yarninspirations Caron Cakes...so far so good. Thank you for this beautiful and easy pattern. Your tutorials are awesome!!!! I am using Scheepjes yarn and 4.00mm hook..Still i don't have enough yarn to finish all the 50 rows..I just made 42 rows and I am almost out of yarn. 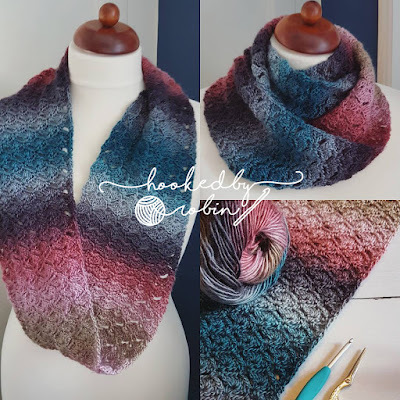 Fantail Shell Stitch Scarf - free crochet pattern and video tutorial!